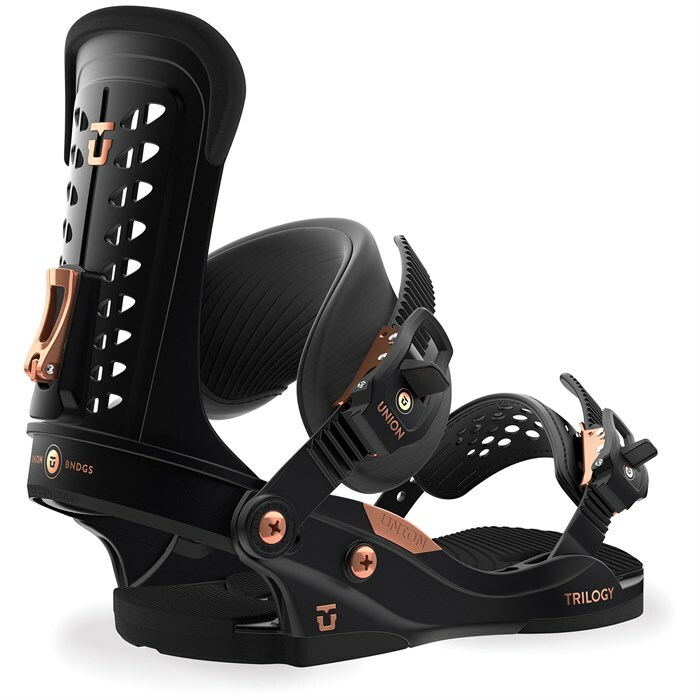 The Union Trilogy Snowboard Bindings are the confidence inspiring workhorse kit for the rider who is out in any condition, all day long. Just like Union team boarder Jessica Kimura, these high strength binders can handle any terrain with poise. Enjoy first class comfort thanks to overpadded ankle straps, multi-density thermoformed EVA bushings, and Ultragrip toe straps. If you demand a bombproof setup with versatility to match, strap in and hunt legendary lines on the Union Trilogy Bindings. Stage 4 Force Lady  Blended to tackle any terrain, the Stage 4 Force Lady base is durable and powerful for riding in any condition, day after day. Trilogy Highback  A female specific version of Union's iconic Force Highback, the Trilogy version is tapered towards the top, providing flex and tweakability where you want it, support and durability where you need it.